Photos by Asia Morris. Photos of Anchor Place courtesy of Panic Studio LA. This morning the City of Long Beach in partnership with the The Long Beach Community Investment Company (LBCIC) and Century Housing Corp. celebrated the grand opening of Anchor Place, a new affordable housing development at the Century Villages at Cabrillo (CVC). 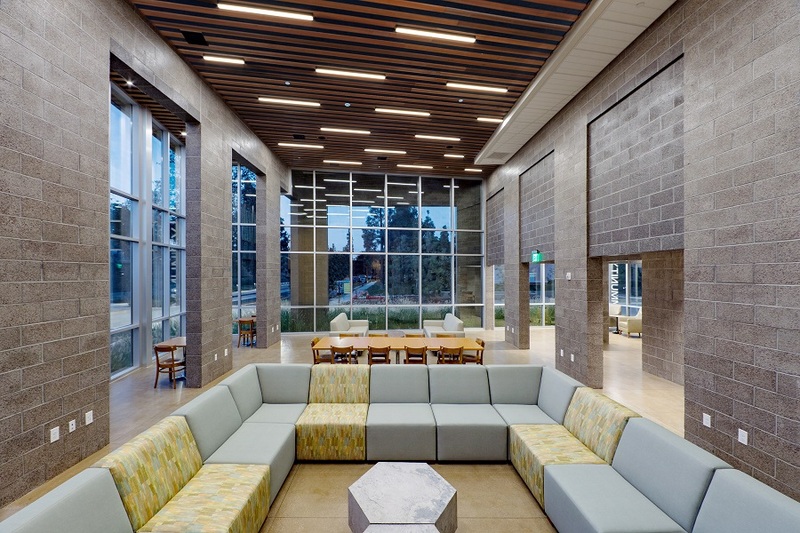 Anchor Place is the fifth phase of the 27-acre CVC campus development, which includes the restoration of the original social hall located at the adjacent Savannah Cabrillo Naval Housing Complex and transit infrastructure improvements along River Avenue. CVC is a supportive housing community of over 1,500 residents, including veterans, homeless families and those at risk of experiencing homelessness. 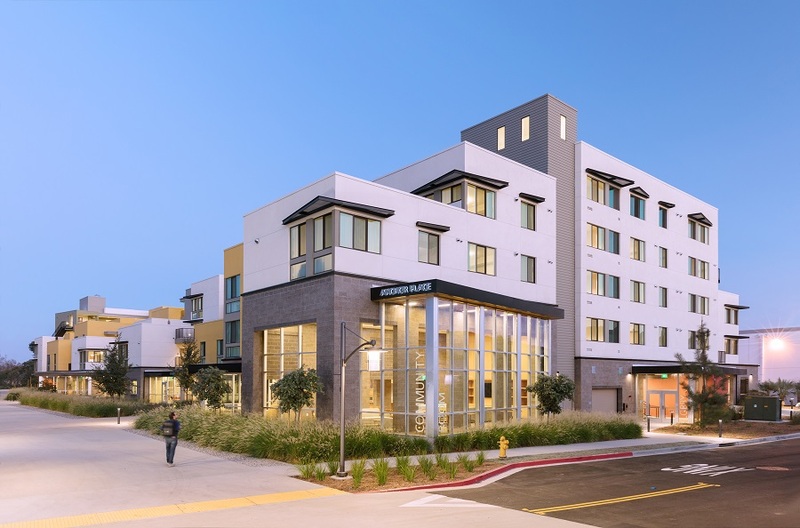 The five-story addition to the CVC campus includes a mix of 120 one-, two- and three-bedroom units, including 75 reserved for veterans experiencing homelessness and 45 units for extremely low-income residents. Residents can also use the new building’s extensive open space and courtyard recreational areas, and will have access to supportive services, such as case management, physical and mental health services, employment services, life skills training and counseling. A community room at Anchor Place. The 75 units for veterans are subsidized through Veterans Affairs Supportive Housing (VASH) vouchers provided by the Housing Authority of the City of Long Beach (HACLB) and Housing for Health, a County of Los Angeles flexible housing subsidy program. The vouchers provide $720,000 yearly for a total of $10.8 million, to guarantee housing support for homeless veterans for an initial 15-year period, according to the city. An inaugural awardee of the State of California’s Affordable Housing and Sustainable Communities program, funded through the state’s cap-and-trade auctions, the project will also include the relocation of the Long Beach Transit bus stop, currently located just outside the development, into the center of the CVC campus. The state funds combined with grant monies from private foundations will support the new transit hub. A HOME loan from The LBCIC. An Affordable Housing Program (AHP) loan. Financing from the Affordable Housing and Sustainable Communities Program (AHSC) through the State of California and the Strategic Growth Council. Those who spoke to commemorate the opening included Garcia, Seventh District Councilmember Roberto Uranga, Chair of the LBCIC John Thomas, Director of Health and Human Services Kelly Colopy, Century Housing Corporation Board Member Carrie Hawkins, Senior Vice President of Century Housing Corporation Brian D’Andrea, Veterans Affairs Long Beach Healthcare System Director Walt Dannenberg and Councilmember for the State of California Strategic Growth Council Mike Flad. For more information on the City’s affordable housing developments, visit the website here. For information on Century Villages at Cabrillo, visit the website here. Anchor Place is located at the Century Villages at Cabrillo at 2000 River Avenue.